Why is it that if you pause at the bottom of a squat for even just two seconds before standing back up it feels 12x harder? During any move, your muscles are affected by something called the stretch reflex. 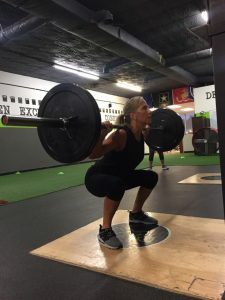 Essentially, your muscles are loading up like a spring when they are being stretched out (like during the downward movement of the squat) and when you change directions (standing up in the squat) you get a little extra bounce from the spring. Pausing your reps takes away that stretch reflex. Depending on the length of the pause you also can get a pretty intense isometric contraction on the muscles at the bottom. An example of an isometric contraction is your abs during a plank. They may not be moving, but they are contracting hard to prevent movement. If you pause your squat for 5 seconds at the bottom, your legs are going to be fighting hard to keep you in that position. Plus, when you go to stand up you will have no momentum to rely on. So when should you use paused reps? They are great for irritable or previously injured joints. Paused reps allow you to use less load, so the stress is lighter on the joints, but your muscles have to work harder to hold the weight in place. They are also an effective tool if you struggle at a particular spot in a move. If you find yourself getting stuck at the bottom of your bench press on the last rep each time it might be a good time to lighten the load and pause your reps at the bottom. Try out paused reps in one of your next workouts. They can be used in just about every exercise, and can also be a great way to break through plateaus when you are stuck on a particular weight. Use them to take a little stress off of your joints, or to just give yourself an extra challenge. Your Fitness. Your Program. Your Way. These are our class/small group hours--Personal Training by appointment.